“You meet the nicest people on a Honda.” Remember that advertising slogan? That was before Hondas had four wheels in America. The commercials always featured happy people scooting around on their motor bikes. Thanks to a front-page article in the National Newspaper Association’s publication, Team Carter’s appeal for fire department patches has gone nationwide. In the photo left, 6-year-old Carter Sanborn shows off the fire helmet and T-shirt sent to him by Pat Shearer, a retired Athens-Clarke County firefighter. Looking on is Carter’s older brother, Christopher, one of Team Carter’s biggest boosters. That’s why I could relate to Carter Sanborn’s love of everything to do with firefighting. In October, I introduced you to Carter, who lives in Ashburnham, Mass. While he is growing up in New England, his roots are right here in Georgia. His great-grandfather, Aubrey Hires, was Wayne County school superintendent in the 1950s. His great-grandmother, Kathleen Hires, was my 12th-grade homeroom teacher. And his grandfather, Pete Hires, and I have been buddies since 1952. 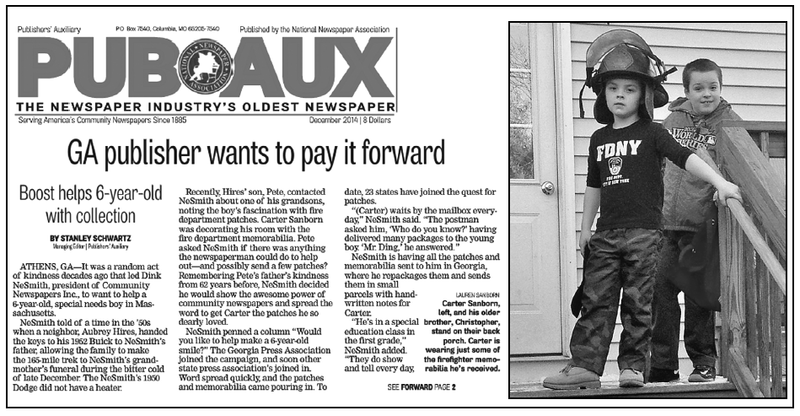 So when Pete mentioned that his special-needs grandson, 6-year-old Carter, was collecting fire department patches, I decided to see whether you—our readers—could help. We formed Team Carter, and the response has been overwhelming. Of the 250-plus patches in Carter’s collection, I’ve contributed only a few. You’ve done the rest. “My husband is a retired Fairfax County, Virginia, firefighter, but we don’t have any of his patches. This one was given to us by a firefighter we met at a campground in Venice, Florida. “We have your article with us, and as we meet other firefighters, we will share your article. Here’s another example, this one from Pat Shearer. He called one day and said, “I have some things Carter might like.” When the retired Athens-Clarke County fireman showed up, he was carrying a stack of prizes for Team Carter. The centerpiece was Pat’s personal smoke-stained helmet, along with his identification tag. Just this week, I got a call from Jacksonville Beach, Fla. A friend is sending another fire helmet for Carter. Say what you want, but the world is still full of caring, kindhearted people. Team Carter is testimony to that. Over by my desk is a box full of patches, badges, T-shirts and memorabilia, waiting to be mailed—one by one—to Ashburnham. Pete says that Carter and his mailman have become well- acquainted. Carter knows the mail truck’s schedule, and the first-grader is waiting by the mailbox Monday through Saturday. This week, the National Newspaper Association’s publication features Pete’s grandson on its front page. Our goal is to have all 50 states represented on Team Carter. So far, patches have arrived from 26 states, plus Japan, Canada and Costa Rica. Besides, if you want to meet some of the nicest people, visit a fire station. Tell the firefighters about Carter and his collection. Join the fun and the team.